What's wrong with this picture? 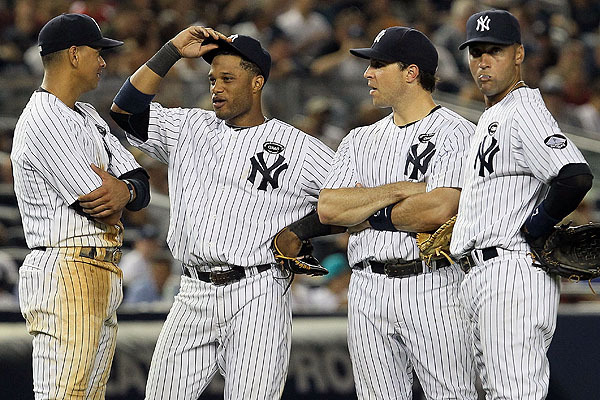 It was 2009, when the Yankees got huge contributions from Jorge Posada, Melky Cabrera, Hideki Matsui, and AJ Burnett on the way to a World Series Championship. It wasn't that long ago was it? And it featured arguably the greatest infield of all-time. Now three-fourths of them are out, and you have to wonder if they will ever be on the field at the same time again. After a gruesome injury in last year's ALCS, Derek Jeter has been on lockdown rehab and appears ready to rejoin the lineup before opening day. Alex Rodriguez had a gruesome injury to his pride with his miserable performance in last year's ALCS, but then it was compounded with offseason hip surgery that will sideline him indefinitely. Initial reports were that he'd be gone half the season, but as has been said on many different occasions, he may have played his last game in pinstripes. Now Mark Teixeira is sidelined with a wrist injury suffered while practicing with the Team USA World Baseball Classic team. Speculation is that he'll be gone 8-10 weeks. That leaves the steady guy who mans second base. Robinson Cano is one of the most valuable properties in baseball, and will be requiring the Yankees or someone else to pay him as such at season's end. He does it offensively and defensively, with a swing like Bonds and an arm like Trillo. But Cano's shaking off cobwebs too after going three-for-forty in the 2012 postseason. If A-Rod hadn't drawn all the fire, Cano would have been some easy target practice. With the Yankees lineup in shambles, is it possible they could let Cano go at or before season's end? Anything is possible. The four-man unit had their moment in the sun with the 2009 title, but for all their hype as a prolific quartet they only won the one. Now it looks like their time is done.